The figure of Francisco Canaro dominates tango music from 1916 to 1935. Perhaps the most popular tango artist ever, his discography weighs in at over 3700 entries. As a musician Canaro was average but as an artistic director he was accomplished, disciplined and innovative. He knew better than anyone how to read the pulse of the public and this was the key to his popularity and his success - he was phenomenally wealthy, richer than Gardel. 1916 - replaces the flute with the double bass of Leopoldo Thomson, thus creating, along with Roberto Firpo, the Sexteto Típico (traditional sextet). 1920 - hires an arranger for his orchestra (Luís Riccardi). His style is the beginning of the end of the guardia vieja. 1921 - puts together a 32 piece orchestra for the carnival dance, including cellos. 1924 - introduces the estrebillista (refrain singer). 1924 - Canaro and Firpo extend the line of bandoneons and violins, expanding the sextet into the Orquesta Típica. With the arrival first of D'Arienzo and then Troilo and the golden decade of the fourties, Canaro's importance wanes. We could say that his contribution to tango music ends with the decade of the thirties. His tangos from the twenties are extraordinarily innovative, his milongas from the thirties are full of excitement, but his fourties material - especially the tangos - is left behind by the artists that came after him. Canaro on CD - what kind of collector are you? Well, for Canaro's vast oeuvre, I am going to cheat and suggest two CDs here - the second, just for people who simply must have Poema. Canaro, like other orchestras with a populist bent, recorded many valses and milongas and our main suggestion is to get a CD which presents some of those. With seven valses and six milongas (count them! ), this cd outclasses the old favourite EBCD-30 on El Bandoneón and is the cd of choice for beginning a collection of Canaro's music - even if the cover isn't as nice. I still remember when Suramusic released the album Poema, introducing us to a Canaro that in 1936 and with the intimate voice of Roberto Maida was rather more tender that what we'd become accustomed to. That album has gone out-of-print, but here is a cheaper replacement that has more tracks. Apart from a cracking transfer of Poema you get a whole bunch of beautiful tracks. Their tender rendition of the Donato classic El adiós is a real surprise. If you are planning on a big Canaro collection, you might want to go straight to the Canaro/Maida CDs on Reliquias. if you're looking for a single Canaro/Maida CD, then this is definitely for you. The fidelity is very good. I love Canaro - give me more! 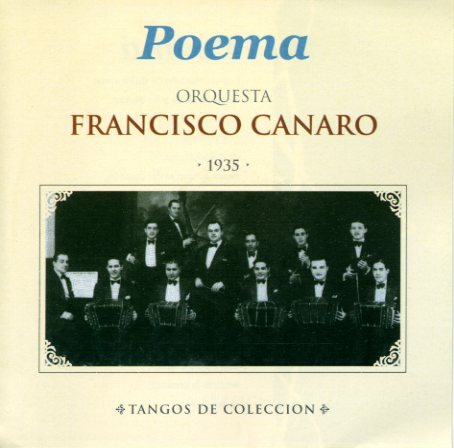 This album presents Canaro's best recordings with Ernesto Famá in the years 1939-1941. This is not my favourite period for Canaro, as he lost subtlety in his attempt to follow the times, but nevertheless this is a cracking CD. The milongas are outstanding: the best ever recording of El llorón, and Canaro's versions of Parque patricios and No hay tierra como la mía (listen also to Lomuto's interpretations on EURO records). With four valses and some fine tangos, there's a lot to recommend. More classic cuts with Roberto Maida from 1935-1938. They didn't record a poor track. Three beautiful valses, Milonga criolla - what are you waiting for - Chrismas? Classic cuts with Roberto Maida from 1935-1938 - this is the CD to get next, unless you have the RGS album we recommend above. Every track is a classic. Note that the transfer of Poema is in the correct key of C, which is a semitone higher than what we are used to. As a bonus, the album includes the sublime duet version of the vals Un jardín de ilusión with Ada Falcón. Nice Canaro instrumental album, with great versions of El chamuyo, Charamusca and the wonderful vals Noches de amor (although as usual the introduction has been abbreviated. Don't worry, unless you have heard the transfers from Japan, you won't notice). Reliquias porteñas is not the milonga but a pot-pourri of eleven famous tangos mixed together. This early CD is a sampler of Canaro's 40s output. What Reliquias have done here is to make a selection of all the singers that Canaro used in the 1940s, picking choice recordings from each vocalist. Francisco Amor is delightful in 1941's Bajo el cielo azul, as is Carlos Roldán on the delicate Cristal. I even link their version of Otra noche, and I'm normally allergic to Di Sarli numbers recorded by Canaro. Roldán's delivery of the lyric is crystal clear and this seems to be what sets Canaro's 40s numbers apart from other bands. Maybe this is one reason why he is more popular outside Argentina, where non-native speakers find it easier to hear the lyrics, than he is at home. The tracks from the late '40s are also surprisingly strong, such as the wistful Vieja cumparsita (1947) and Confesión (1949) which one might be hard pushed to identify as Canaro, such is the treatment of the compás. The odd-man out is Destellos which was recorded in 1956. With the constant comping of the drums, Canaro manages to sound like a band trying to sound like Canaro. It's disastrous. Ignore this indiscretion and you have a nice 1940s Canaro selection! I didn't want to like this album, but I did. Please note that the very charming Las margaritas is mislabelled on the CD as a vals. It is in fact a ranchera. You can identify this from the emphasis on beat 2 at the end of each phrase.